Alfheim Stadium is the home ground of Norwegian Tippeligaen side Tromsø IL who are famous for being one of the most geographically northern teams to have competed within European Football. First opened in 1987, the small stadium is capable of seating 6,859 supporters per match. Until 2006 Alfheim Stadium surprisingly used the combination of artificial turf and under-soil heating, however during the course of the summer which saw Germany host the World Cup, a more durable artificial playing surface was installed. The record attendance to date was set on the 15th August 1990 in a quarter final match of the Norwegian Cup. A reported 10,225 supporters saw Tromsø IL lost to eventual Champions Rosenborg BK. Images of each individual stand to be added eventually. Away fans (Bortesupportere) are housed are housed within the south stand which is known as the Nordly’s Family Tribune. 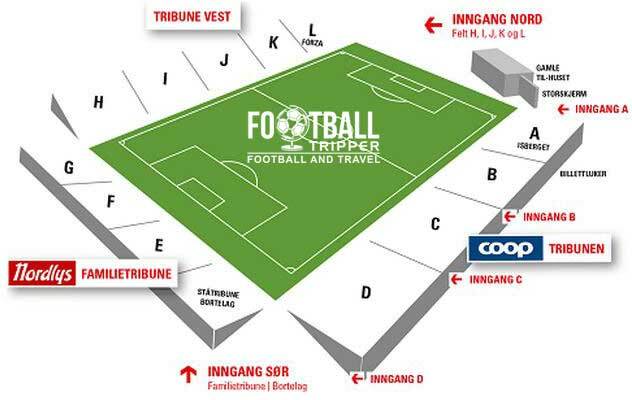 Situated between seating sections E and D as per the above seating plan, the visiting supporters who make the perilous trip to Tromsø enter the stadium via the south-east corner through Inngang Sor. You can purchase official merchandise of Tromo either at the stadium on matchdays or on the web from the club’s official online store. It doesn’t seem likely that Tromsø IL offer guided tours of the facilities at Alfheim Stadion however we’re happy to be proven wrong! Tickets to see Tromsø IL play at their icy fortress can either be purchased online from the official website or in person at the stadium’s ticket booths which open on matchdays just before kick-off. Please note that prices can fluctuate depending on who the team are playing and whether or not it’s a league or cup match. Alfheim Stadion is situated just over 1.0 km from Tromsø’s city centre which overlooks the coastline of the article circle. Most Football Trippers can easily walk to the ground in 15 minutes flat – providing that there aren’t any snow storms! There is a medium sized car park behind the main stand however the exact matchday parking arrangements are unclear. The island of Tromsøya hasn’t got any railway infrastructure! There doesn’t appear to be much of a bus network either! Tromsø Airport sits 4.8 km north of the city centre and is the busiest airport in Northern Norway with International status due to its flights around Europe. The two closest places to stay to the stadium are probably AMI Hotel and Viking Hottel which are both three stars and moderately priced. As the city centre is relatively compact you can easily walk a further five minutes to the remainder of accomodation option such as Radisson Blu.